For the sixth year in a row, Linda Dardarian has been named a California Super Lawyer by her peers in the legal community. [Update: Linda received this honor every year between 2005 and 2014.] 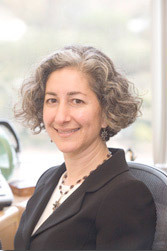 Linda, a partner in the Oakland California civil rights firm of Goldstein, Demchak, Baller, Borgen & Dardarian, has been Lainey Feingold’s principal co-counsel in Structured Negotiations cases for the past fifteen years. Linda has played a critical role in developing Structured Negotiations as an advocacy and dispute resolution method and in effectively implementing it in a wide variety of cases. Dardarian’s careful strategic thinking and legal analysis were instrumental to the national success of the Talking ATM effort in the United States. Among other things, she has used Structured Negotiations to expand access to health care for people with disabilities in hospital settings and to protect financial privacy of blind consumers by advocating for web accessibility and braille, large print and audio format of print information. Linda and her law firm have donated countless hours to disability rights issues, including drafting and filing friend-of-the court briefs on issues such as accessible websites and audio description in movie theaters. In addition to her work in Structured Negotiations, Dardarian also litigates disability rights, environmental, wage and hour, and other employment and civil rights cases in California and around the country. Linda Dardarian is not only a great lawyer, but she is fun to work with and a supportive friend and colleague. The Law Office of Lainey Feingold is glad to honor Linda on the well-deserved “Super Lawyer” 2010 designation. Read more about Linda Dardarian’s law firm. Read more about the Super Lawyer designation. This is a post about Linda Dardarian. Linda is a lawyer who works with Lainey Feingold. She has been named a California Super Lawyer for 2010. Linda helped develop Structured Negotiations. That is a method for solving problems without filing a lawsuit. She has used Structured Negotiations in many cases. Some of these cases are about Talking ATMs, health care access, and Braille. Linda also files cases in court in the U.S. Those cases are about disability rights, environmental, wage and hour, and other employment and civil rights issues.